BAIT and Adidas Consortium push the advancement of the EQT Support line in their latest collaboration, dubbed “R&D.” BAIT’s enthusiasm for state-of-the-art technology and Adidas’ obsession for research and development are what brought the “R&D” pack it’s unique design. The EQT Support 93/16 Boost and the EQT Support Future Boost both feature the newly developed M.O.D. (Mesh Optimized Dynamic) Cage, specifically designed for each model’s support and comfort. The M.O.D. Cage enhances the shoes’ stability while keeping the upper flexible, breathable, and the lacing system quick to use. A skeletal grid pattern that nods to the anatomy of the foot, runs all throughout both primeknit uppers; glow-in-the-dark for the 93/16s and 3M reflective for the Futures. 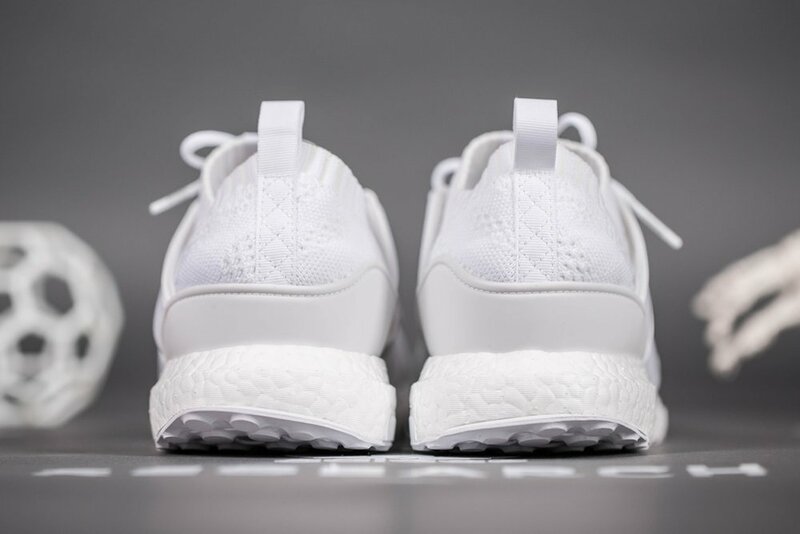 The EQT Support 93/16 was designed as a triple white boost to embody the “Research” side of the story. It features a very clean and almost sterile aesthetic, that serves as a blank platform for the experimental side of design. Lace options come in pure white, and white/reflective. The EQT Support Future was designed as the “Development” side of the concept. It has been reconstructed as a hybrid, taking cues from the Ultraboost and EQT Support ADV uppers. It boasts 35% more Primeknit than the original and serves as the more functional side of design. Lace options come in solid black, and black/reflective. The BAIT x adidas Consortium M.O.D. Cage EQT Support “R&D” pack will be available online by RAFFLE.